John built a machine that could probably be considered art work as well as a digging machine. I think I would build a second MACHINE to dig with and leave this one to look at. That gel seat looks really comfy. Bill needed to dig the basement out under his house. If the machine will run on batteries then it should run on 110 volt AC. Bill used a 2 HP, 1750 Rpm cw, 115 volt motor to run the HYDRAULIC pump with a 12 gauge, 100 foot EXTENSION cord. 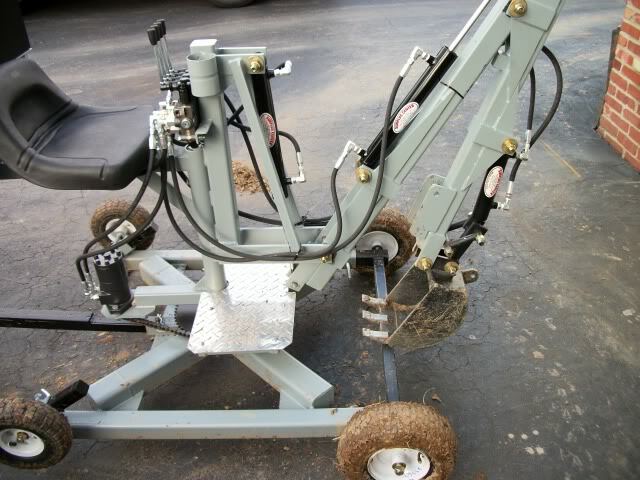 this machine will dig out basements as well as digging utilities. Charles made some changes to the base and control VALVES. looks like this backhoe is destined to go on the back of a small tractor, it is even painted too match. The backhoe can run on its own or attached the back of a tractor! different view of the same backhoe! Thanks for making the plans available at such a reasonable price. It really digs, it exceeded my expectations right away! Welder shane built his backhoe and added a HYDRAULIC slew. it still turns 360 degrees. Digs as good as it looks. dan built a backhoe that will go on a three point hitch for the big digging. the backhoe can run SEPARATELY for tight spots and greater production. Because two machines can be going a one time. check out that seat. excellent! view of the moving platform. I love to see what people can do with a good design. 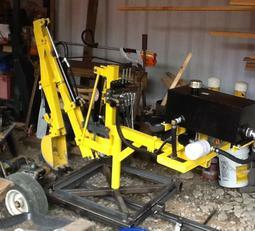 I have used and abused the machine to come up with a durable, inexpensive and easy to build backhoe. Seems to me that the builders put a little bit of themselves into what they build! Thank you for the pictures, keep sending them to us! !